Woods of Wales is a family run company based in Mid Wales. We supply and install high quality solid wood and hardwood flooring, all over the UK, using timber mainly from Welsh woodlands and other sustainable sources. We specialize in Home grown hardwood and, after years of experience, we believe that timber grown in Wales has a distinct character of its own. Our hardwood timber are sourced from forests all over Wales to produce a unique range of hardwood and solid wood flooring. These flooring are tongue and grooved and are available in random widths and regular sizes. The most popular hardwood flooring are the solid oak tongue and grooved floorboards, prefinished in either oil or lacquer. Other British hardwood used regularly are Ash and Alder. With solid wood ash flooring being very pale in colour and the solid wood alder having a rich warm colour. 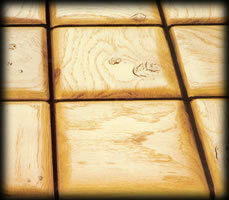 Also available are the solid wood floor tiles and end grain tiles. Produced by slicing a log into round discs instead of planks, kiln dried and then shaped into solid wood floor tiles. They are available in Welsh Oak, Welsh Birch and English Oak and come prefinished, ready to lay. Please use the website to browse through our selection of hardwood flooring and solid wood flooring. Be sure to contact us if you don't find what you are looking for.